There's a good chance that you've already partaken in the annual tradition of watching It's a Wonderful Life this holiday season, and if you're a huge fan of the classic Frank Capra film starring Jimmy Stewart and Donna Reed, then you might want to check out this new print from artist Laurent Durieux that will be available for purchase from Dark Hall Mansion. 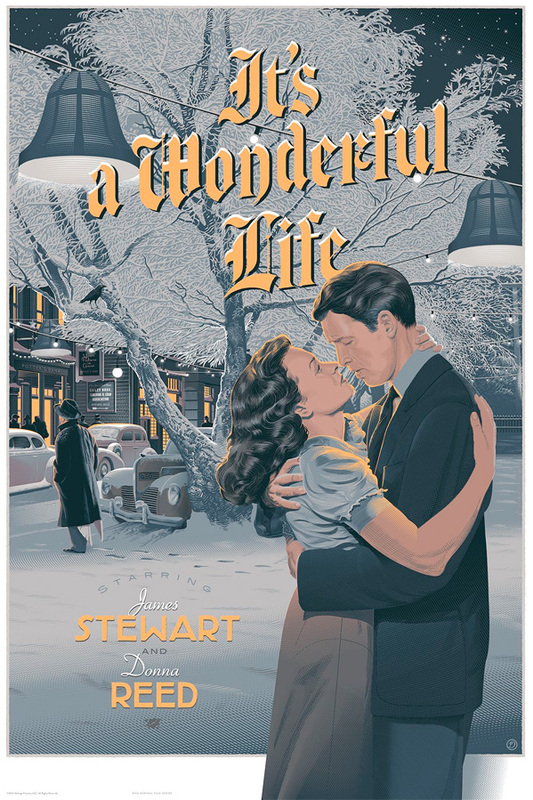 This officially licensed print pays tribute to the holiday fantasy, and it won't be as hard to get ahold of as a Mondo print, since this will be a timed edition sold over three days. That means if you go to purchase during that time, you'll get one, but never again after that. Now there's a few different variations beyond the regular and variant prints, so pay attention. First of all, the regular edition of the print (that's the gold one), is the timed edition that will be on sale beginning midday on Friday, December 19th and available through 11:59pm (PST) on Monday, December 22nd. You won't have any problem getting ahold of this version of the print, but there are three very special editions of this piece that will be much more difficult to get ahold of on Friday. Also, if you want to buy multiple prints, you'll have to purchase them individually, because that's just how the online store works. Beginning at 9:30am (PST) on December 19th, the blue variant edition will be for sale along with even more limited foil and wood editions. The variant has an edition of 150 and will cost $100, while the foil verion has an edition of 75 and will cost $150. In addition, there will be two wood editions of the poster, each based on the regular and variant print color schemes, and each with an edition of 15 that will cost you $300. All of these will be selling through the Dark Hall Mansion store online right here. Each and every print will be 24×36, so pick your poison and Merry Christmas, you wonderful old Building & Loan! Cool? Dig that look. Classic newspaper print.